Multiple fetuses are often delivered early. How babies are delivered often depends on how they are lying in the uterus. All possible combinations of fetal positions can occur. Possible complications include abnormal presentation of one or more of the babies, prolapse of the umbilical cord (the umbilical cord comes out ahead of the babies), placental abruption, fetal stress or bleeding after delivery. Because there is higher risk, precautions are taken before delivery and during labor. These include the need for an I.V., the presence of an anesthesiologist, the ability to perform an emergency Cesarean delivery and the availability and possible presence of pediatricians or other medical personnel to take care of the babies. With twins, all possible combinations of fetal positions can occur. Both babies may come head first (vertex). They may come breech, meaning bottom or feet first. They may be lying sideways or oblique, meaning at an angle that is neither breech nor vertex. Or they may come in any combination of the above. I’m carrying twins. Will I need a Cesarean delivery? Not necessarily. Delivery of twins has more complications than delivering one baby, but many twins can be delivered vaginally. Discuss it with your healthcare provider. 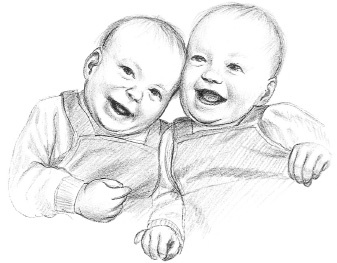 When both twins are head first, a vaginal delivery may be attempted and may be accomplished safely. It may be possible for one baby to deliver vaginally. However, the second one could require a Cesarean delivery if it turns, the cord comes out ahead of the baby or the baby is stressed following delivery of the first fetus. Some doctors believe delivery of two or more babies is more safely accomplished with a Cesarean delivery. After delivery of two or more babies, medical personnel pay close attention to maternal bleeding because of the rapid change in the size of the uterus. With more than one baby, it is greatly overdistended. Medication, usually oxytocin (Pitocin), is given by I.V. to contract the uterus to stop bleeding so the mother doesn’t lose too much blood. A heavy blood loss could produce anemia and make a blood transfusion or long-term treatment with iron supplementation necessary.